The government plan offers no vision for the island: what will it be like to visit, live or work in Lantau in 2026, 2036 or beyond? The report doesn’t say. At the same time it tries to micro-manage tourist development in ways that are counter-productive. The plan offers no specific data to support any of its assumptions and includes no forecasts of any of the key metrics, e.g., population, visitor numbers, residential housing volume and investment, tourist industry investment, road traffic, etc. The report claims to achieve a ‘balance’ between conservation and development. In fact the word ‘development’ appears 126 times in the LanDAC report and ‘conservation’ just 20 times. It makes no mention of wetlands, dolphins or buffalo and cattle – not only three of the most critical conservation topics, but major tourist attractions in their own right. The plan overturns the core principle of the previous Lantau concept plans of no large-scale development. The government sets no limits on development and offers no protections to the natural or cultural heritage, despite claims to the contrary. It makes no guarantees to protect South Lantau’s unique coastline, plants and animals. These omissions make it clear the intention is to introduce a mass tourism economy to South Lantau, with no ceiling on visitor numbers, vehicles or housing and hotel construction. The plan purports to be about ‘economic development’ but does not even touch on the most critical infrastructure for the 21st century: high-speed broadband. The average broadband downlink speed for South Lantau is approximately 5% of the SAR average. LanDAC makes many references to creating a low-carbon economy on Lantau, but these appear to be symbolic only. It offers no serious discussion about the carbon impact of the road-only Macau bridge, the Chek Lap Kok-Tuen Mun freeway link and the third airport runaway. It seems that low-carbon is important only in the context of certain aspects of ‘Lantau development’ and not in others, and certainly not in the context of Lantau’s current situation, including planning, house design, electricity supply, transport, etc. The LanDAC report expends no effort in making the economic case for the East Lantau Metropolis. An expert from real estate consultancy Icon City has said the government’s projections “belong to the unknown.” The project is environmentally destructive and assumes population projections that also have been called into question. It implies freeway and flyover development across Lantau country parks and Mui Wo that are inimical to South Lantau as a prospective tourist destination. The LanDAC report makes many suggestions for tourist activities that seem intended to replicate commercial experiences already available elsewhere. Instead of offering stale attractions, we should acknowledge the impressive experiences already available on Lantau and ensure that they do not disappear. 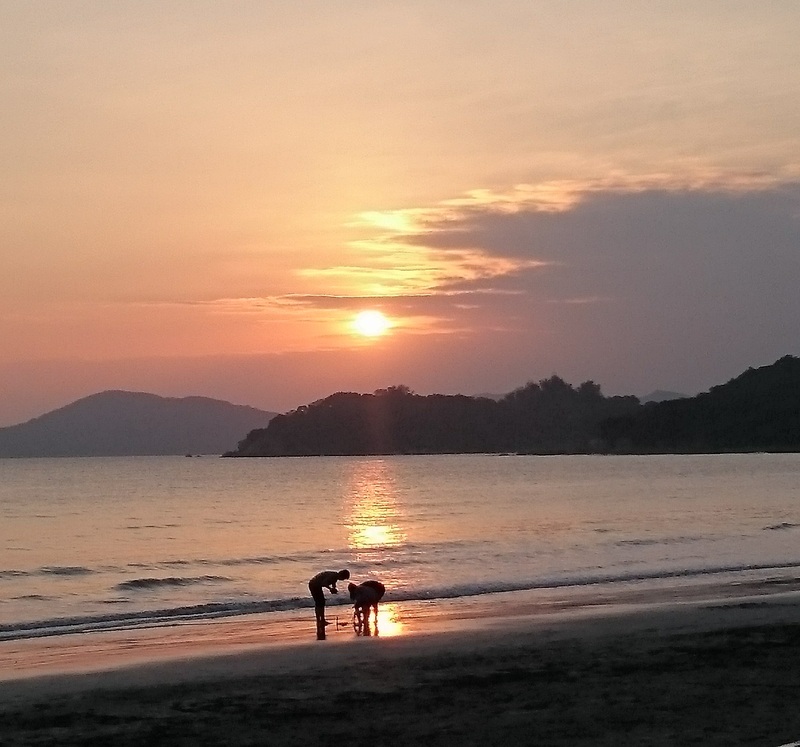 From Central Hong Kong, Pui O Beach can be reached by a ferry and bus journey of less than an hour, followed by a short walk past a thriving but shrinking wetland where buffalo frolic in the mud. The beach has a bar/restaurant and a picnic and camping ground. At dusk it offers spectacular sunsets such as the one above. No other major city in the world has such a simple but powerful experience so close to hand. But because of the lack of conservation protection, the wetlands that form the unique and magical part of this experience will soon disappear under the weight of repeated waste dumpings. This inadequate environmental protection, combined with the kind of unrestrained development model that LanDAC advocates, mean that this and other Lantau wetlands have a limited lifespan. Before long, visitors will find themselves strolling past a mountain of waste material after which, inevitably, the land will be sold for commercial use. What will be left is a beach next to a hotel or apartment complex and a stunning tourist experience will have disappeared. The starting point for any kind of commercial tourism planning in South Lantau must be the recognition that South Lantau has strong natural attractions that must be protected. Environmental and economic sustainability are inextricably linked. Protection of the plant, coastline and wildlife will not only preserve Lantau’s assets for future generations but will ensure its sustainability as a tourist destination. New tourist developments must pass environmental audit – no adverse impact on biodiversity, coast protected areas – to be carried out by an independent agency (ie, not the EPD). The micro projects and tourist ‘zones’ set out in the LanDAC report serve no purpose and should be scrapped. The other starting point for considering tourism is acknowledging Hong Kong has no expertise whatsoever in green, low-impact or eco-tourism. One idea is to hold a contest: either for a design team to come up with green, sustainable tourist plan for South Lantau, or perhaps for a single project. A competition would attract attention and ideas from around the world and promote Lantau as a green holiday destination. Instruct Ofca to conduct a study into how to narrow the divide between islands broadband services and those of the rest of the SAR. It may consider measures such as – a compulsory minimum speed, introduction of a broadband Universal Service Obligation, infrastructure sharing, public-private partnerships. Instead of arbitrarily advocating green policies for certain projects, why not use Tung Chung and the villages of South Lantau as a test-bed for low-carbon, low-waste green living and environmental policies? This is not mere symbolism; if it is not worth pursuing a low-carbon Lantau now, why is it worth pursuing under the ‘development’ plan? The sensible starting point is an environmental audit of all current policies and practices on Lantau – housing planning and design, electricity supply, transport services, water supply. The proposed use of ferries for around-island transport could be a promising one as it can service tourists and local residents while taking pressure off the road network. But this would require significant new licensing and franchising arrangements from the Transport Department to allow service providers to gain the scale necessary to acquire clean-burning vessels. Your suggestions are well argued and sensible. If the govt.’s goal were ecologically sensitive development of Lantau for the benefit of residents and visitors, the measures you suggest could form the foundation of such development. But it isn’t. The govt’s goal is the exploitation of Lantau for the benefit of the usual suspects. Your suggestions and indeed any opposition to this will be utterly ignored – or drowned out by the sound of earth movers and jackhammers. ‘Indigenous’ ‘villagers’ will be bought off with land currently within country park boundaries, on which they can continue their highly lucrative property development businesses. The only people left to complain will be a few idealistic locals and expatriates. I hate to be such a cynic but years in HK, and particularly the last decade, have turned me in to one. Yes, we do seem to be going down the same path. What gives us hope is that unlike ten or 15 years ago Hong Kong people are much more willing to stand up for the environment and for their rights. They won’t let government cash in the city’s natural assets without a fight.